As Hambledon celebrates its 2018 Midsummer Festival with a weekend of events, here is a glimpse into the village’s past. Hambledon Village Trust, landlord of the community-run shop, has received photographs almost certainly from the late 1960s and early 1970s showing the shop as it was then. The photographs were provided by the Ainsworth family who used to live in Pendle Cottage, which forms a part of the shop building. They were on a journey down memory lane when they called in last weekend. 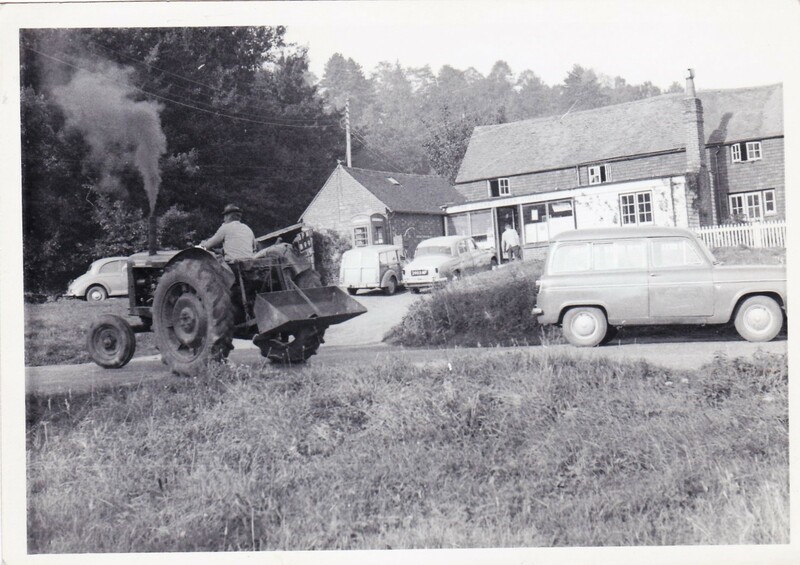 The first, in black and white and probably dating back to the 1960s, shows a busy scene outside the shop with a farmer trundling by on his Nuffield tractor. Can anyone identify him? 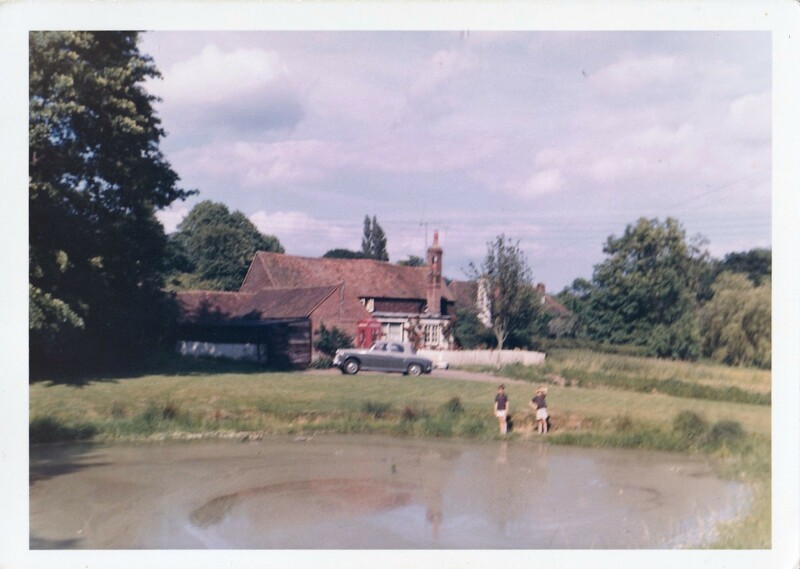 The others, in colour, show the shop and pond, with a Rover saloon parked outside, possibly belonging to the family who lived in the cottage, which was then called Duck Cottage. 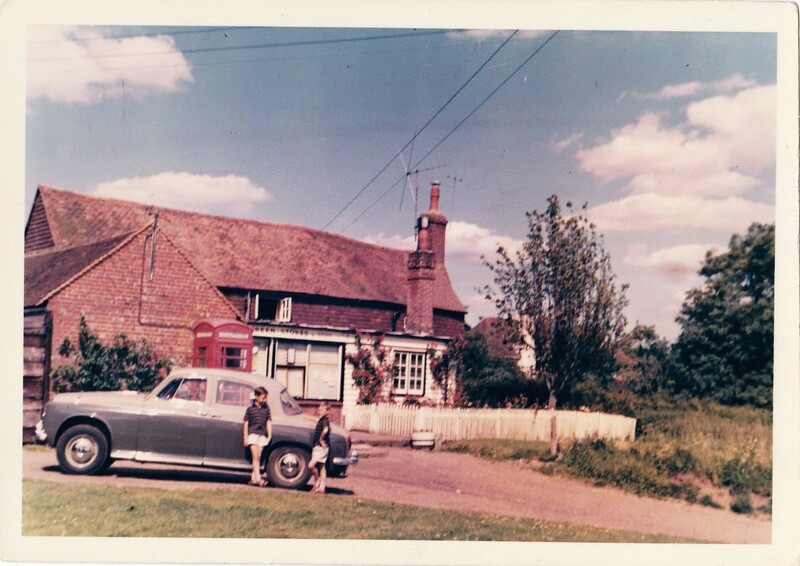 It was renamed Pendle Cottage when Joan Hardy and her husband moved there in 1982. 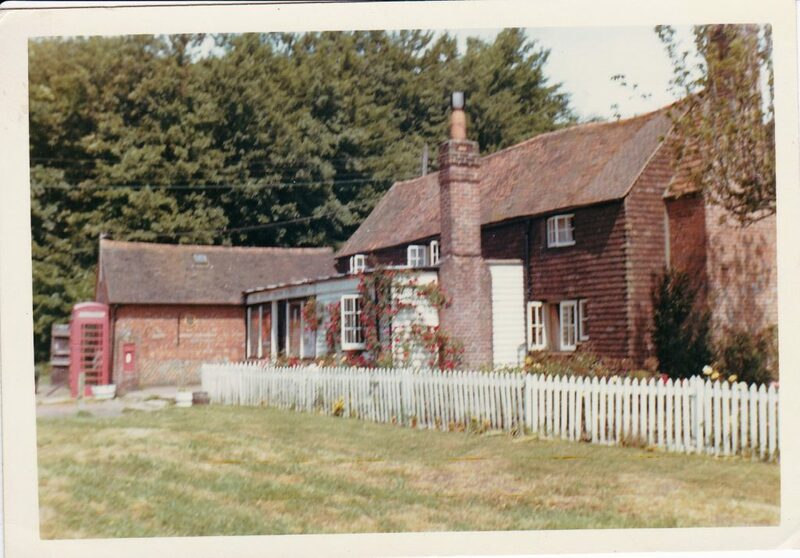 It is hoped that old village photographs, and of fetes gone by, will be on display at the village website stand at the fete tomorrow, which opens at 12.30. 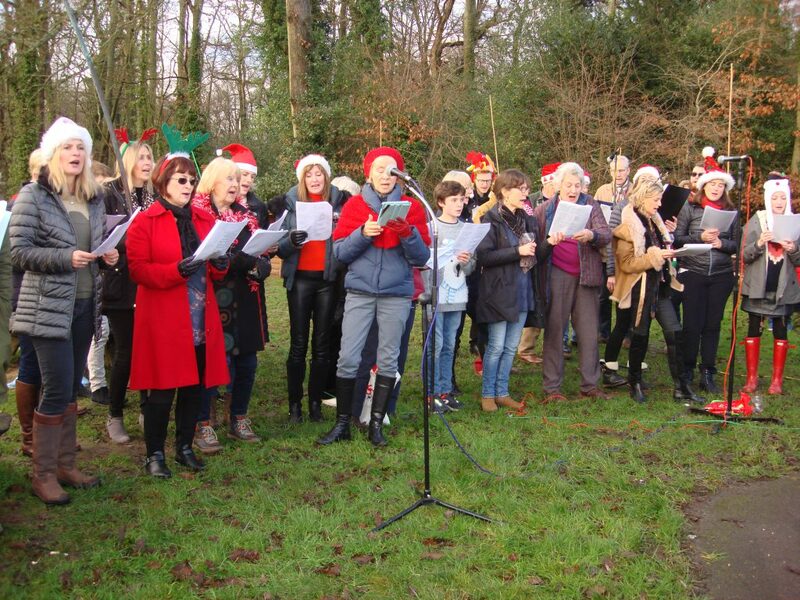 Full details of fete events can be found on this website on the Latest News menu. If anyone can shed any further light on the photographs please leave a message on this website. We’re nearly there. 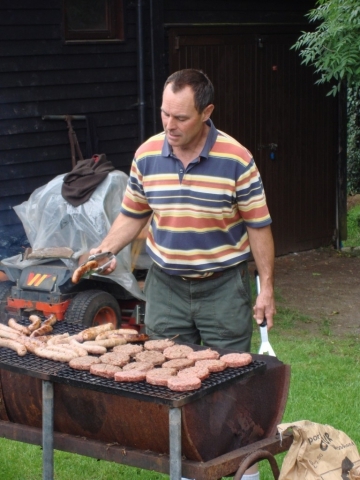 Sausages have been bought for dogs to catch, burger buns have been tested, dry weather has been arranged. 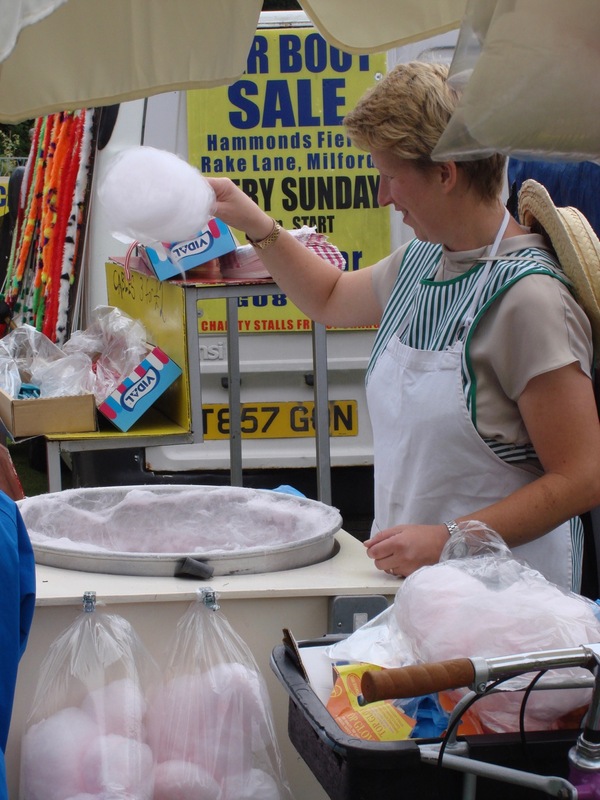 If you are running a stall, please be there in good time to prepare for a 12:30 opening. If you have offered to help with setup for the weekend’s activities, please try to make the meeting at the Cricket Green at 10:30 on Thursday morning. The Village Fête will be held on Saturday 23rd June. 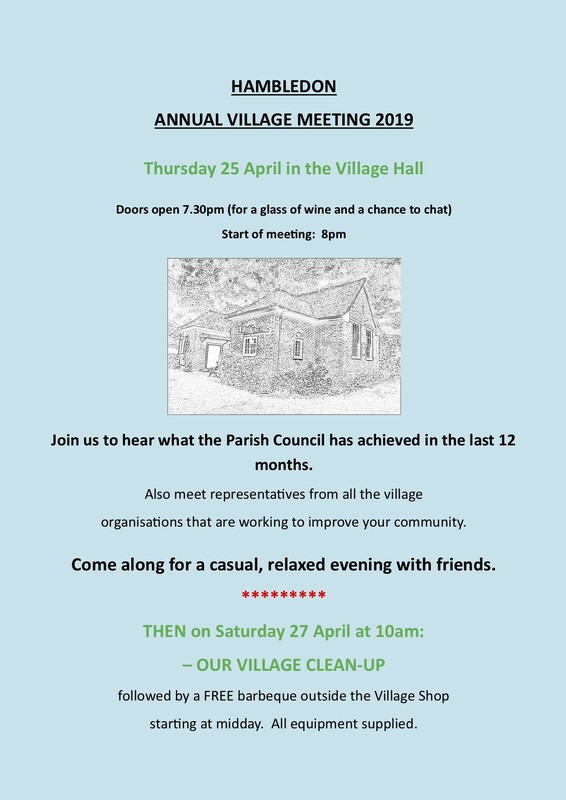 If you would like to get involved, either by helping to run a stall, or by volunteering in some other way, please come along to this meeting. 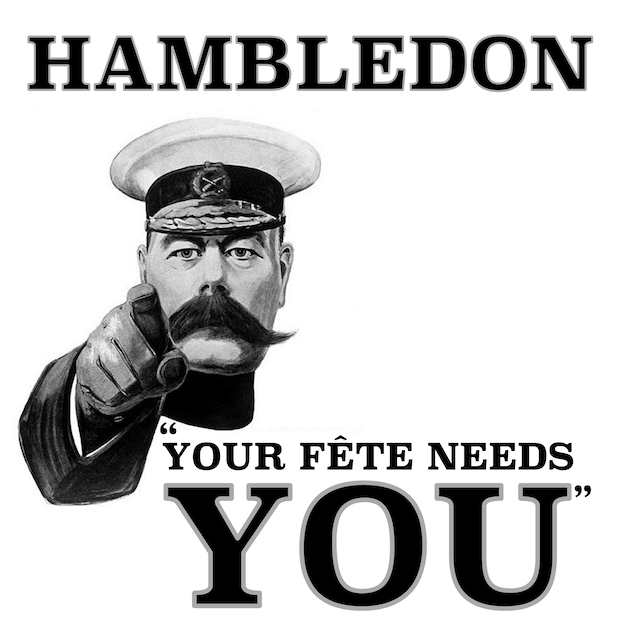 If you are unable to attend but would like to be involved, please email us at: hamblefest@hambledonsurrey.co.uk. 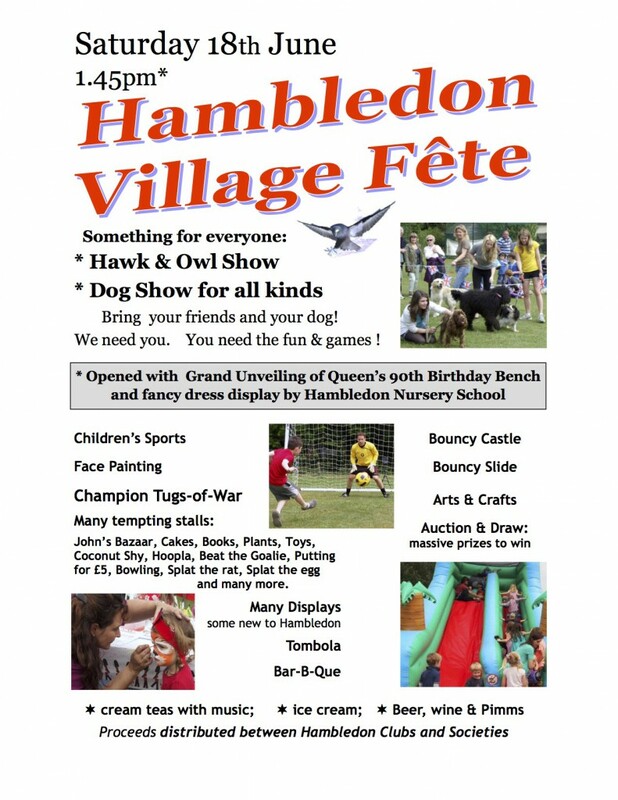 The Village Fête is part of the Hambledon Midsummer Festival, for more information visit the website at hambledonfestival.co.uk or the Facebook page at facebook.com/hamblefest. 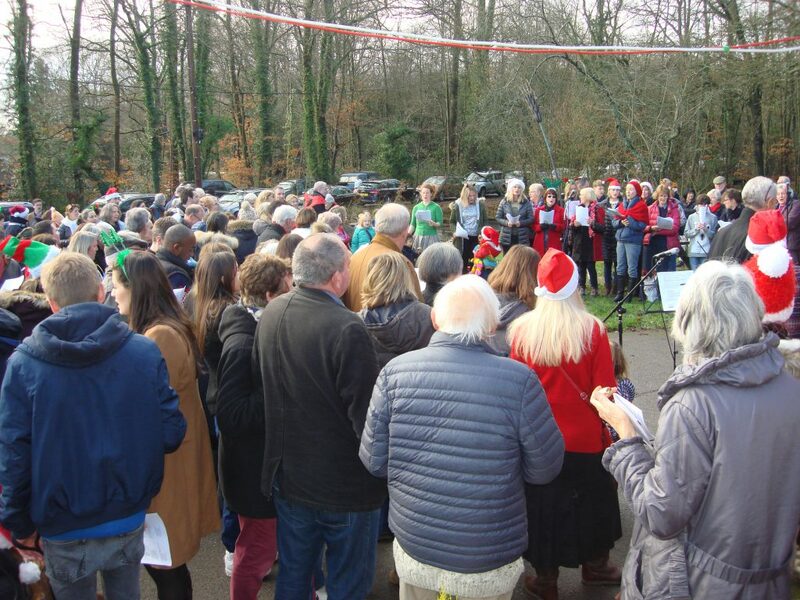 THE Hambledon Village Dance, a sell-out event at the Village Hall on December 9, raised a record £1,250 for local cancer charity KatCanDo. 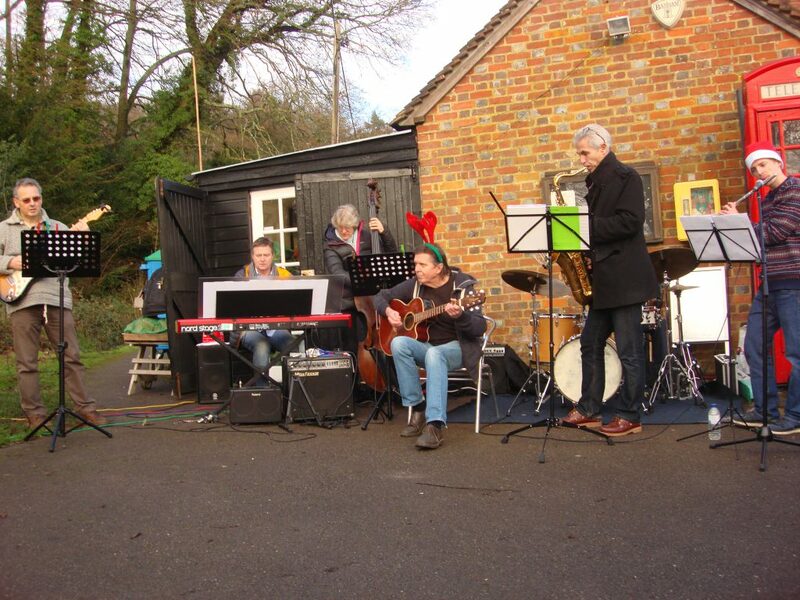 This year’s party was organised by Mike Blanchard, keyboard player with the band Toxic Sausage. Mike, who lives in the village, wanted the dance to raise money in memory of Pat Hill, a friend and Merry Harriers regular who died earlier this year from complications from blood cancer. Mike also wanted to mark the successful surgery at the Royal Surrey County Hospital received by Stewart Payne, Hambledon resident and friend of Pat’s, who was diagnosed with oesophageal cancer last year. KatCanDo, which is run entirely by volunteers, raises money for the purchase of cancer-related equipment at local hospitals and hospices. It was set up in 2004 by Kate Coles, a friend of Stewart’s, who was suffering from bowel cancer and who overheard one of her specialists complaining that a piece of equipment that would be beneficial to sufferers was not available on the NHS budget. With the support of friends Kate set up KatCanDo, a registered charity, with the express purpose of working with cancer care specialists to provide much-needed equipment at the Royal Surrey and Frimley Park hospitals and to aid cancer sufferers in local hospices. Kate lost her battle with cancer in 2006 but her friends have kept the charity going and it has donated more than £300,000 to help the fight against the disease. Stewart suggested to Mike that KatCanDo would be a worthwhile cause to donate the money to, and he agreed. The dance was a big success, with Toxic Sausage belting out music that kept the dance floor packed. Mike took it upon himself to organise this year’s dance, booking the hall, selling the tickets and taking no fee for performing. Well known around the village as Big Mike, he also has a big heart, and his kindness and hard work is much appreciated. Pat’s sons James and Jono attended the dance and were delighted and touched by the level of support. Thanks also go to Brigitte Coleman for the buffet and to the volunteers who ran the bar. 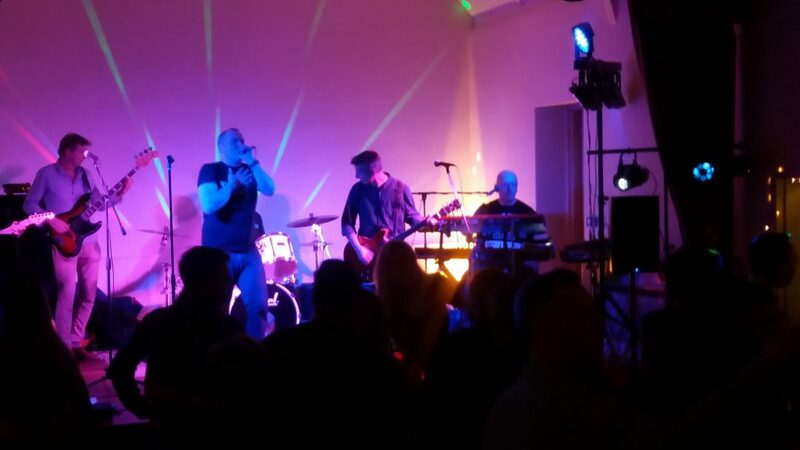 Toxic Sausage have a big following in Hambledon and will be appearing again at the Village Ball on June 23rd as part of the 2018 Midsummer Festival weekend. If you would like to know more about the work of KatCanDo please visit www.katcando.org.uk. In summer 2018 Hambledon will be hosting a weekend of festivities to celebrate midsummer. 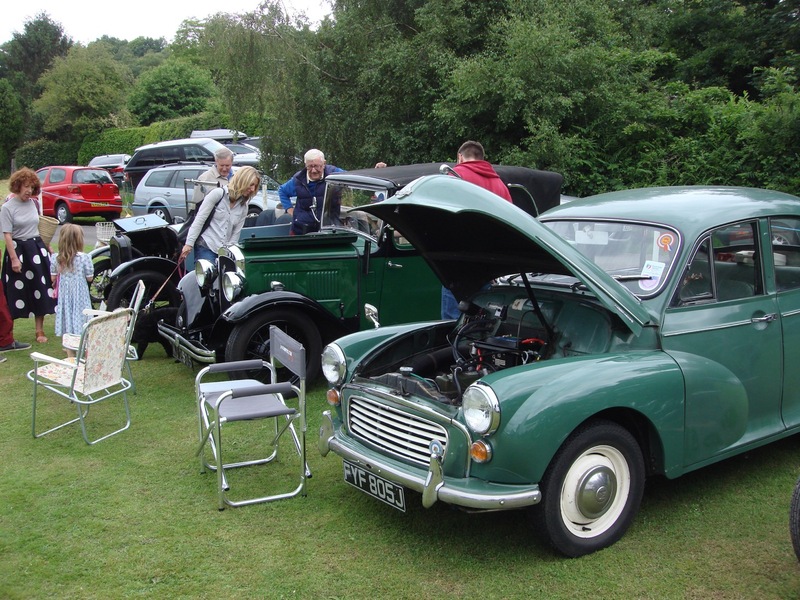 Alongside the traditional fête and ball (both on Saturday 23rd June) there will be an evening of big-band jazz, accompanied by local food and drink (Friday 22nd June), a Church service on the Cricket Green on the Sunday morning and a Classic Transport Rally (also on the morning of Sunday 24th June). Tables at the Ball always sell out fast. 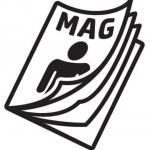 Until the end of December, Villagers can reserve tables ahead of the start of official sales in January, by either completing the form on the festival website at hambledonfestival.co.uk, or filling out the paper form available at the Village Shop. Tables can be reserved for either 10 or 12 attendees (first come, first served) at a cost of £30 per head. We also have a few seats available at tables for people who are not part of a larger group. As usual you will need to provide your own food & drink, though there will be a paid bar for those who wish to use it. The dress code is “creative black tie”. 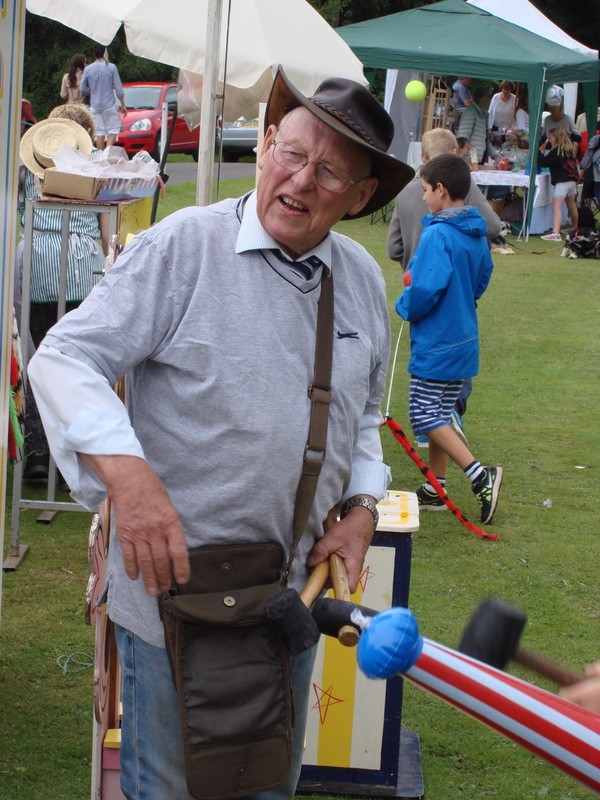 If you’ve previously helped run a stall at the Village Fête, we hope you’ll be willing to do so again. 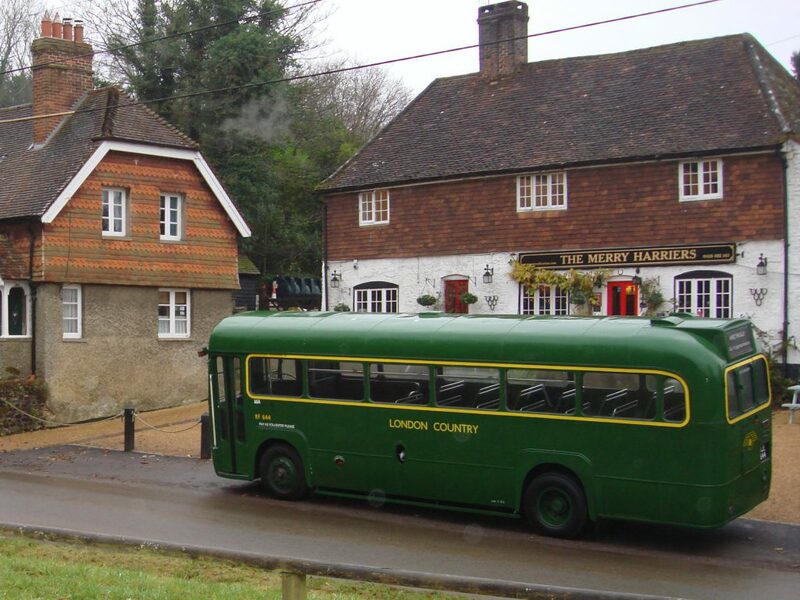 If you haven’t been involved in the past but would like to get involved, please email us at hamblefest@hambledonsurrey.co.uk or mention your interest at the Village Shop. Please don’t be shy – we’re going to need lots of help throughout the weekend. 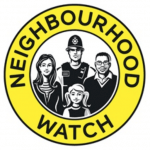 There will be a meeting for all participants at 8pm on Wednesday 7th February in the Village Hall. You can keep up to date on the plans for the weekend at the festival website or on Facebook at facebook.com/hamblefest. The date has been set for next year’s Hambledon Village Fete and it will be Saturday 23rd June 2018. 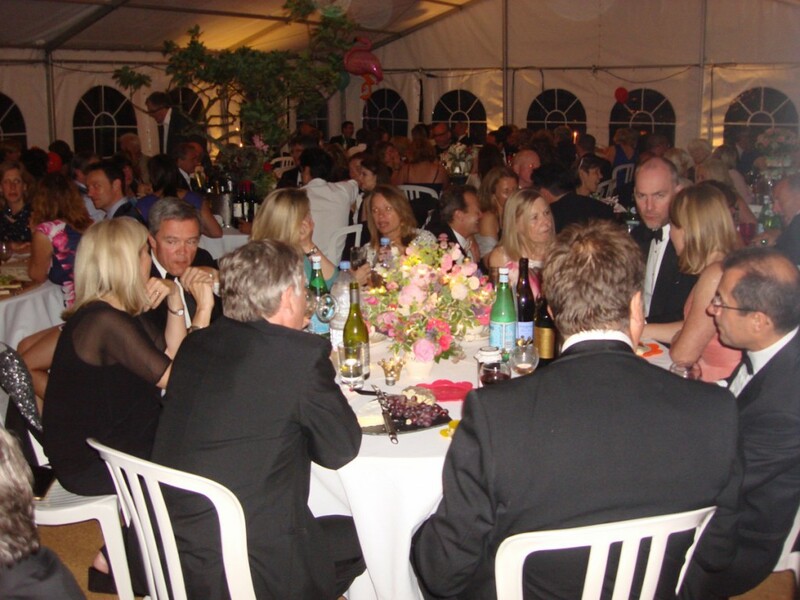 As in previous years the Village Summer Ball will be held on the evening of the same day. In addition a more informal, family-oriented, entertainment event is being planned for the evening of Friday 22nd June. 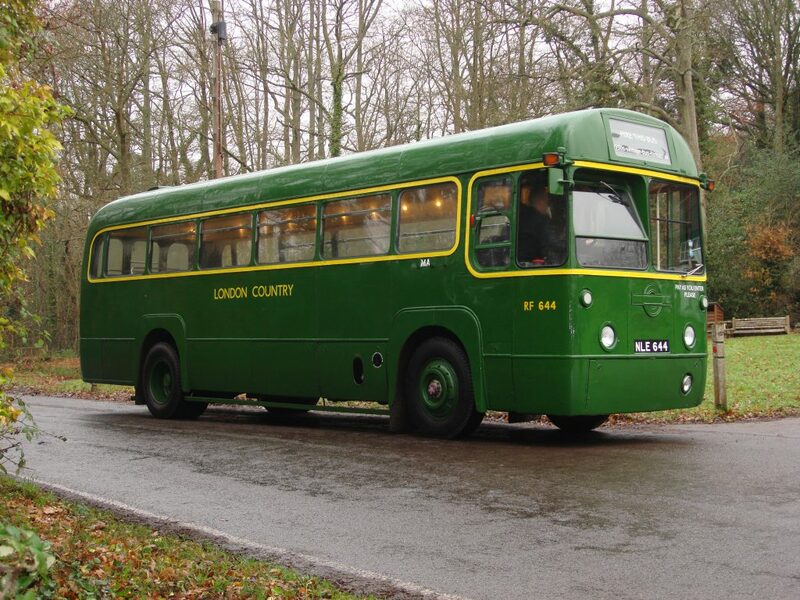 Planning has started and we’ll keep you informed, here on the web site and in the Parish Magazine, as those plans develop. Or you can follow @hamblefest on twitter. Please don’t forget that St Dominic’s School Summer Fete and DomFest are being held at the school this year on Saturday 1st July. 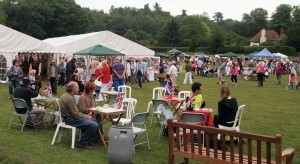 Philip Underwood, fete organiser, and the village website team report on a busy weekend in Hambledon. 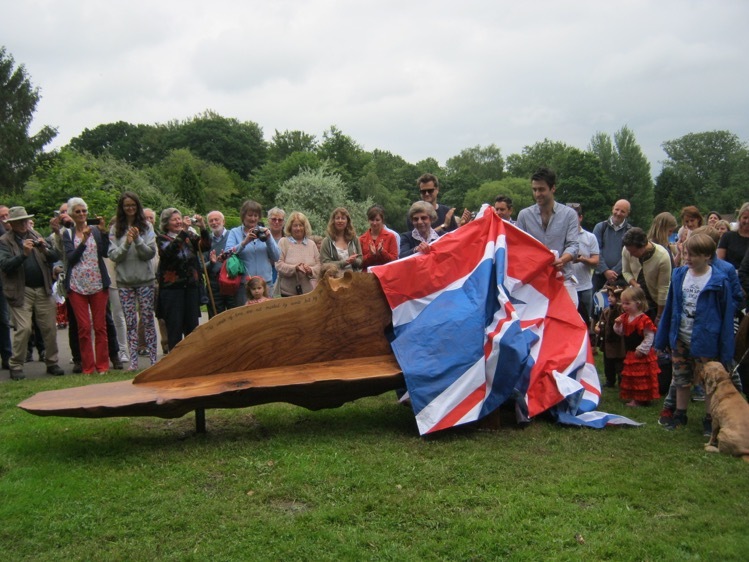 An eventful weekend saw the unveiling of a new bench in commemoration of the Queen’s 90th birthday, a very well-attended fete, a packed Midsummer Ball, a special church service…and an exclusive interview with the award-winning author Louis de Bernières. 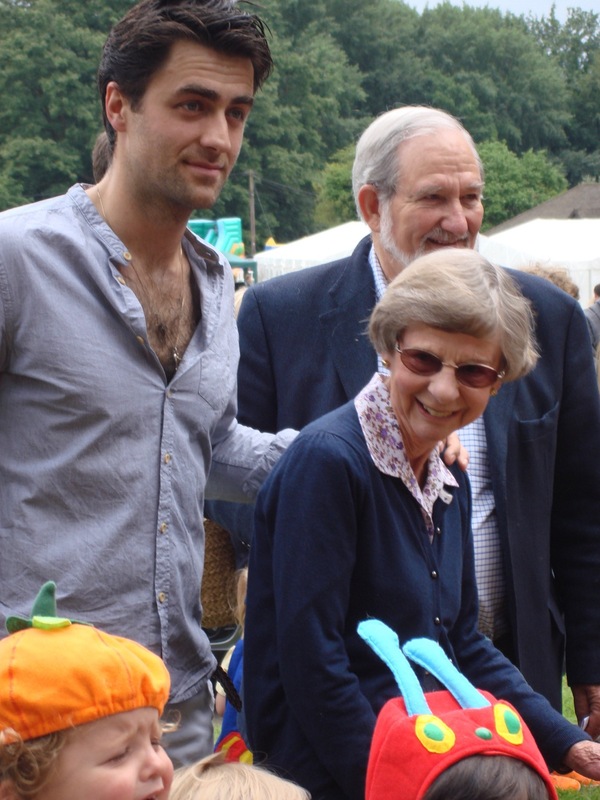 Louis, whose work includes the acclaimed Captain Corelli’s Mandolin, grew up in Hambledon and wrote about his time here in his book Notwithstanding. Before opening the fete on the village cricket green on Saturday (June 18) he took time out to film an interview with www.hambledonsurrey.co.uk in which he talked candidly about his childhood. The interview can be found here. He was then in attendance as the new bench was unveiled outside the village shop, overlooking the village pond. It was commissioned on behalf of the village in recognition of the Queen’s 90th birthday and was unveiled by Jane Woolley, clerk to the parish council, who has worked tirelessly for Hambledon in many capacities. 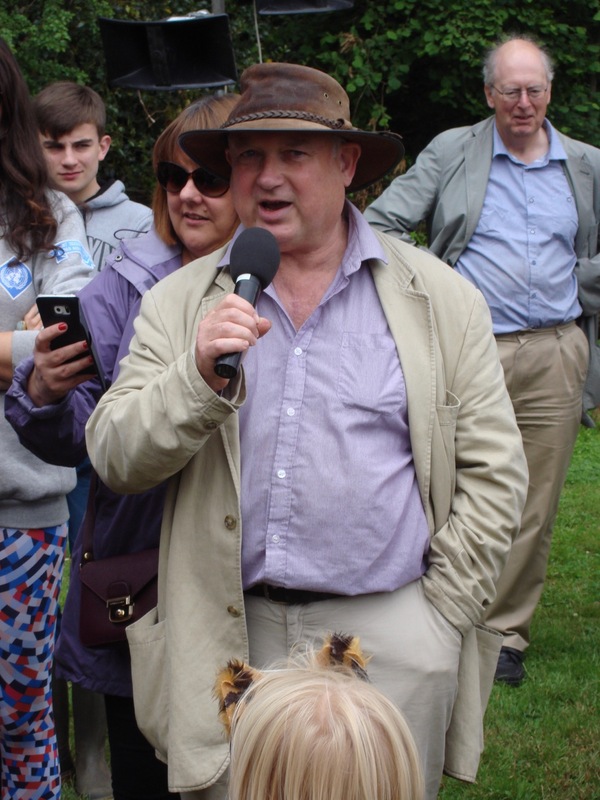 She was introduced by John Anderson, parish council chairman. The bench, carved from local oak, was designed and made in Hambledon by local craftsmen Dorian van Braam and Olafur Mason. Its first occupants were children in fancy dress from the village nursery school. 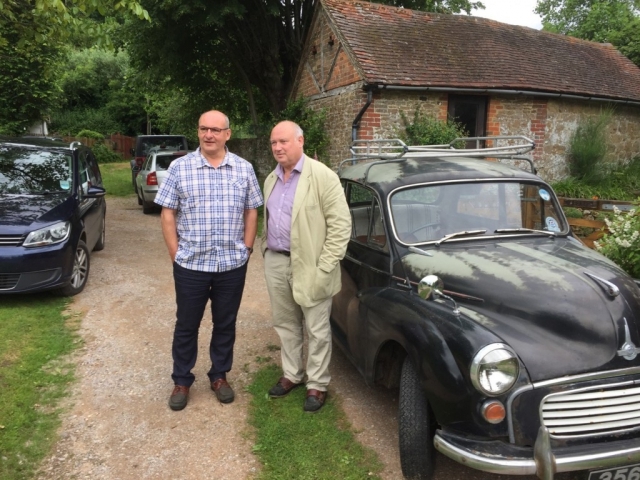 Louis de Bernières then declared the fete open, remarking that Hambledon was little changed from his childhood days in the 1960s and 1970s. The traditional fete featured all the usual attractions with games, stalls, bouncy castle, face painting, arts and crafts, food and drink. Children competed in a tug of war, local pooches and their owners took centre stage in a dog show. A popular feature was the display by the Hawk and Owl Show. When the last stragglers finally left the village green it was time to turn the marquee into a venue for the Midsummer Ball. Several hundred villagers and their guests sat around circular tables to wine and dine and then dance to the music of local band The Likeness. 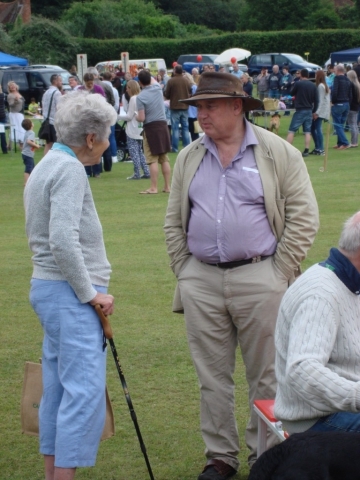 The following day a Sunday morning service combining congregations from Hambledon and Busbridge churches was held in the marquee, celebrating Father’s Day. 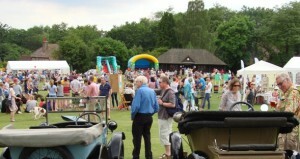 Proceeds to the fete and ball went to support village clubs and activities. 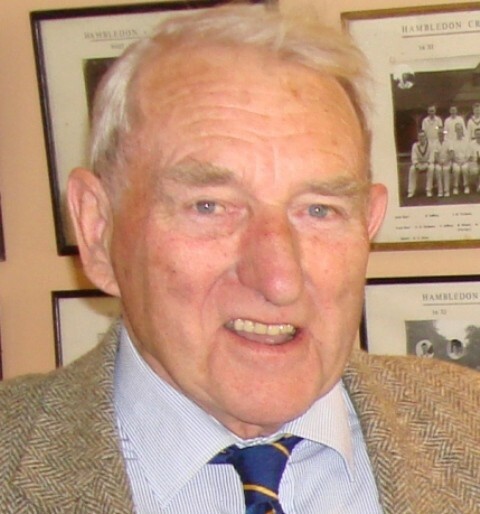 Thanks go Philip Underwood and his many helpers, including Hambledon Football Club, for organising the fete and for the hard work of Sue and Ginger Blackman and friends for staging the ball. A few images from the weekend activities are shown below. If you would like to see the complete photo galleries please click here. Hambledon Village Fête – the excitement builds…. We are pleased to announce that the author Louis de Bernières, who was brought up in Hambledon, will be opening the fête alongside the grand unveiling of the Queen’s 90th Birthday Bench outside Hambledon village Shop at 1.45pm. The big day is nearly upon us. The forecast is for fair weather and temperatures of around 20°C in the afternoon after a few morning showers. 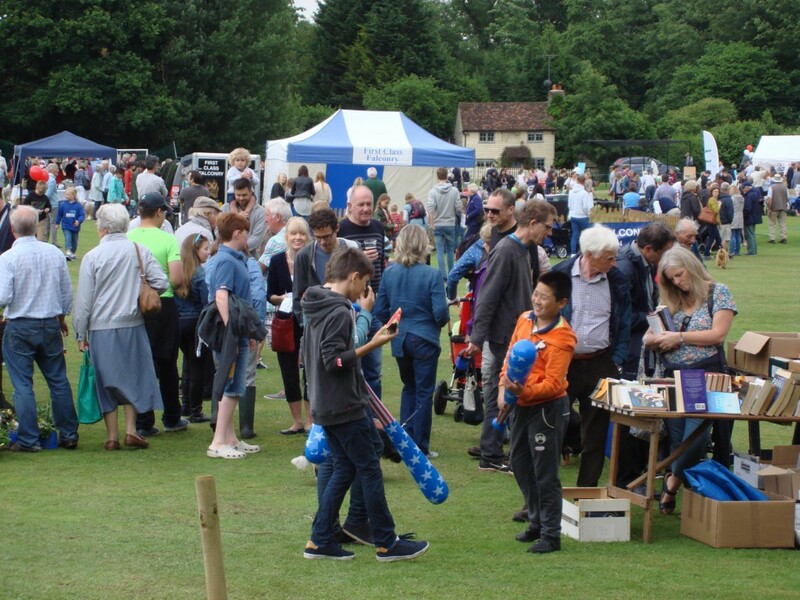 The organisers of the Hambledon Village Fete – which takes place on the Cricket Green on Saturday June 18 – are holding a meeting on March 8 to help finalise arrangements. Please see the following from Philip Underwood. A meeting will be held at 8pm on Tuesday 8th March in the Football Club pavilion. 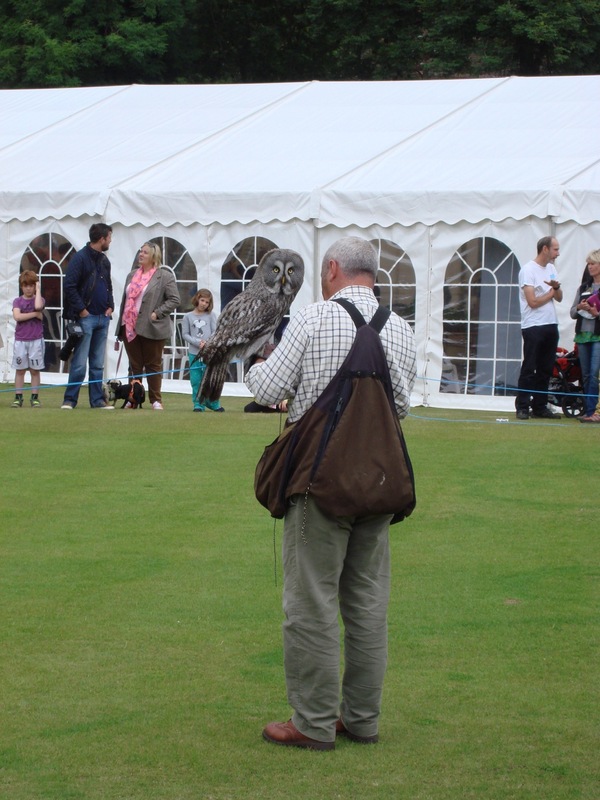 It is important that as many helpers as possible attend as we have to finalise details of the events, stallholders and the general running of the fete. We shall also be looking for donations of prizes for the raffle. 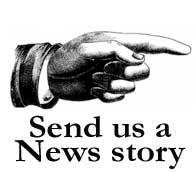 If any local businesses would like to help with sponsorship in return for advertising, it would be appreciated. Many people who have assisted in the past are no longer in the village, so we desperately need new helpers. If unable to come but wish to join in, please contact philipjunderwood@yahoo.co.uk.